What is The Singing Experience and How it will benefit me? The Singing Experience is a complete performance workshop, where you will learn everything you need to be a well-rounded, confident performer – on the stage and in life. Through singing you will embark on an extraordinary voyage of self-discovery. In a nurturing atmosphere you’ll learn more than technique; you will dare take risks, soar above your imagined limitations, and discover the artist within. 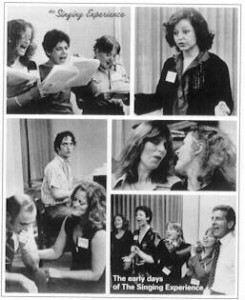 The Singing Experience workshop is a total package comprised of four lively three-hour rehearsal sessions that culminate in your performance at one of New York’s top-notch cabarets, followed a week later by a videotape-viewing party, where your performance is evaluated in a friendly, relaxed atmosphere. In short, you’ll learn total communication skills to truly perform your songs, not just sing them. Each workshop is specially designed to help you progress toward your goal of showing the world the star you really are. You will be surrounded by an extraordinary production team, including a seasoned Musical Director/Accompanist, who will generously convey his/her expertise with you. The show is professionally recorded in high-definition video by Off The Leash Productions. Light and sound wizardry is provided by a brilliant Technical Director. Come join the legions of The Singing Experience alumni. Some are entertainment professionals and others sing for the thrill of it, but all have undertaken this joyous adventure of challenge, commitment and fulfilment and learned to express their inner most self through singing. Give yourself a gift of song. This bliss is immediate, the benefits long-lasting. What The Singing Experience’s Students are Saying? A wonderful wonderful experience for those who love to sing. Linda helps you find your voice and put it to it’s best advantage. No pressure, no competition, a wonderful relaxed atmosphere learning to sing before an audience. SING OUT!